This morning we had a twelve kilometre ride to Darwin train station to catch The Ghan. The train was due to leave at 9am, but we had to be at the station by 8 in order to check in our bikes, trailers and all our luggage. Surprisingly, we left our accommodation as planned shortly after 7am. We obviously can get ourselves organised for an early departure when we have to. On the way to the train station we passed what I did not expect to see in Darwin – fog. Admittedly it was only close to the ground but nevertheless it was fog. Our rear vision mirrors fogged up too! The luggage staff at the train station were very friendly and helpful, and checking in all our gear was a pleasant experience. There was another couple catching the train who also had bikes. 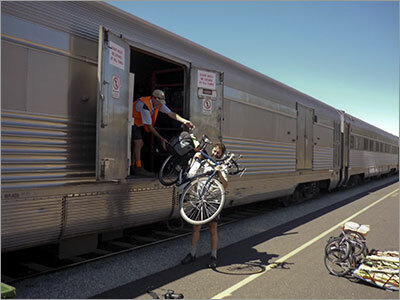 They were from New Zealand, had been riding around Darwin and were catching the train to Adelaide for some further riding. The Ghan is quite a long train – 22 carriages plus the locomotive and motorail. There was quite a crowd of people waiting to board it. We had seats in one of the ‘Red’ service carriages. During the trip we were amused to overhear a telephone conversation being held by one of the passengers in front of us. This person was discussing their travel plans and revealed that they had had to cancel their accommodation booking in Alice Springs because they had planned to stay there and walk to Ayers Rock. It was only after booking and paying for their accommodation that they found out that Ayers Rock is a four hour drive from Alice Springs! This might have been understandable if this person was from overseas but they were clearly from Australia. 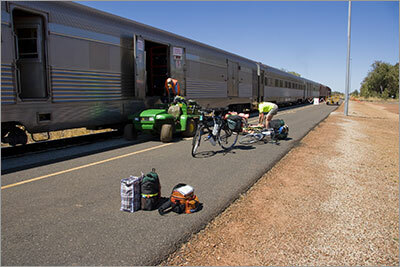 We arrived in Katherine shortly before 1.30 and collected our bikes from the baggage car. The trailers and bags were loaded with other luggage from the train and were driven to the baggage collection area. With The Ghan being so long, the baggage car was quite a distance from the station. The Ghan has a four hour stopover in Katherine to allow passengers travelling further south to disembark and go on one of the many tours available around Katherine and the Katherine Gorge. As an announcement was being made that the Ghan was going to be moved away from the station to allow a freight train to come through, we suddenly realised that two of our bags had not been unloaded. Mark quickly informed the baggage handlers and he was given a ride back to the baggage car to identify the missing bags.